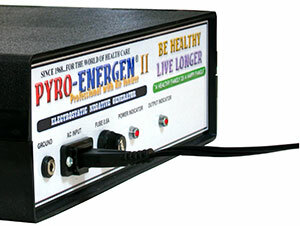 The PYRO-ENERGEN is used with a metal plate or screen connected to the Output High Voltage terminal. 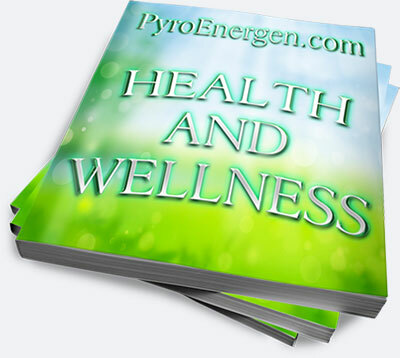 Place the PYRO-ENERGEN on a sturdy flat surface (e.g. on a plastic/wooden table or desk), away from nearby conductive materials. It may be in your bedroom or living room. Do not place the machine directly on the floor. Plug the 1.5 meter Output High Voltage cable to the Output High Voltage terminal at the back of the unit. Connect the alligator clip to a metal sheet, foil or screen. The cable from the PYRO-ENERGEN to metal screen should not be touching to the ground (at least 6 inches far from the floor). Place the metal screen or sheet on a low plastic stool. Sit on a plastic or wooden chair (plastic chair is most recommended for best insulation). Seat cushions can be used for added comfort. Use only clean and dry plastic or wooden materials. 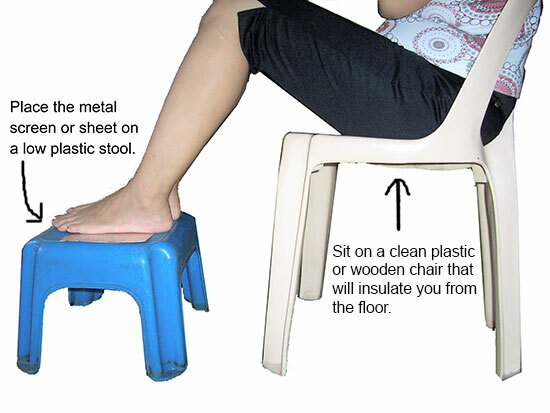 In many cases, it is always best to use plastic chair and stool. Wood is hygroscopic, which means it can absorb moisture from the air depending on the surrounding environment. In effect, it will become a poor insulator and could produce electrostatic leakage resulting to less effectiveness of the therapy. Place your feet (bare or with socks) on the metal sheet or screen. A thin piece of cloth or towel may be placed on top of the screen for added comfort. Finally, have someone plug the power cord into the outlet. If you are using the PYRO-ENERGEN alone, the easiest way would be for you to first turn on the machine, then sit on a plastic chair, and lift both your feet off the floor and place them on the metal screen. Be sure not to bring the power cord near the Output High Voltage terminal and cable. Do not touch any appliance or anything or anyone that is grounded including the machine's AC power cord while your feet is still touching the metal screen. The two indicator lights should light, then, electrotherapy begins. Treatment frequency of 3–5 times a day, at 30 minutes per session is recommended. Using the machine at night even while you sleep can also speed up treatment. If you do not suffer from an illness or disease, once a day or twice a week of treatment is recommended to prevent disease and maintain health. After your session is completed, be sure to remove both your feet first from the metal screen before getting off the chair and touching the floor. Then, unplug the unit from the wall outlet, or turn off the power extension bar if you're using one. Or, have someone turn off the machine for you. Q: Do you need to have your feet first on the metal screen before you turn the machine on? A: You shouldn't attempt to turn on or plug the machine when your feet is on the metal screen. It would be easier if you have someone plug the power cord into the outlet. If you are using the PYRO-ENERGEN alone, the easiest way would be for you to first turn on the machine, then sit on a plastic chair, and lift your feet off the floor and place them on the metal screen. The moment your feet touches the screen, you may feel a slight tingling sensation in your feet for a split-second as the static field jumps and makes a connection to your body. If you are bothered by this, you can do away by placing a thin piece of cloth or towel on top of the screen. 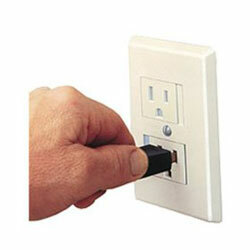 Another alternative is to use a remote-controlled power outlet. If unavailable, one solution is to use a power extension bar that has a separate on and off switch, and use a plastic or wooden stick to turn on the switch. Q: What should I avoid when my feet is on the metal screen? A: The only thing to remember is not to touch any grounded object WHILE any part of your body is touching the metal screen. By not touching any grounded object, it is impossible to induce a static shock. Q: I'm currently using and sitting on the machine, but I need to get off the chair temporarily to do something else quickly. Do I have to turn off and discharge and turn on the machine again? A: There is no need. Just be sure to remove both your feet first from the metal screen before getting off the chair and touching the floor. To resume, do the reverse—sit first on the plastic chair, and lift your feet off the floor and place them on the metal screen. 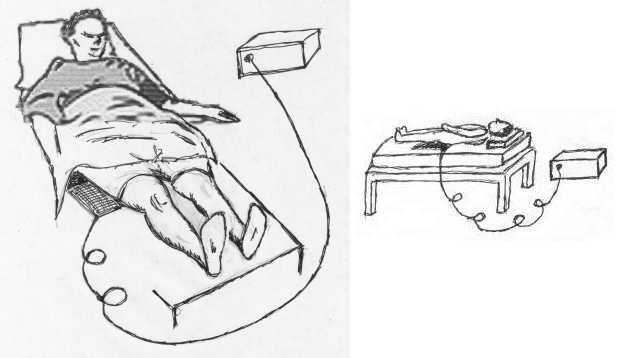 The same similar method can be used when using the machine in lying position. Q: If the 1.5 meter Output high voltage cable is too long, is it possible to fold the cable to prevent it from touching the ground? A: Yes, you can fold and tie the cable to shorten it and avoid from touching the ground. 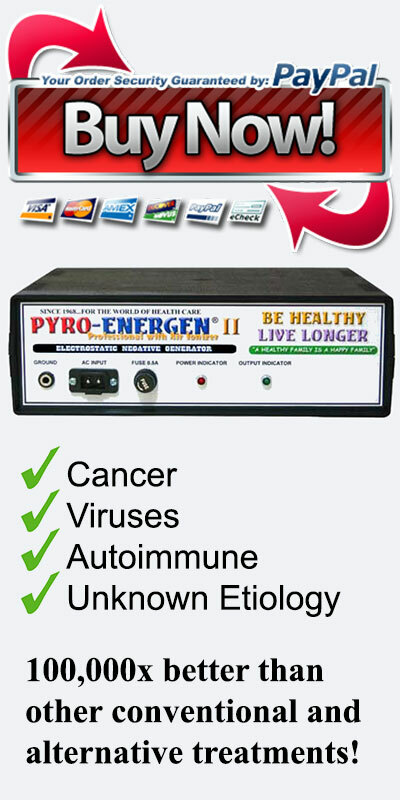 Q: Can a user undergo PYRO-ENERGEN therapy while laying down on bed or couch? A: Yes, absolutely! The only difference is that the metal screen will be placed directly on the bed or couch under the user. The most ideal location to place the metal screen for the majority of users is below the knee area. This is so when they're using the machine alone, they can easily get in and get out of the bed or couch by just lifting their feet off the screen (use similar method in Question #1). Make sure to use a nonconductive bed or couch or foam mattress without metal springs to prevent electrostatic leakage and lesser effectiveness of the therapy. Q: Can I use a mobile phone or tablet computer during the therapy session? A: We have customers who are able to use things like cellphones or tablets without problems even while they are using the machine. This is a case to case basis and will depend on the durability of these gadgets if it can withstand the presence of static electricity. 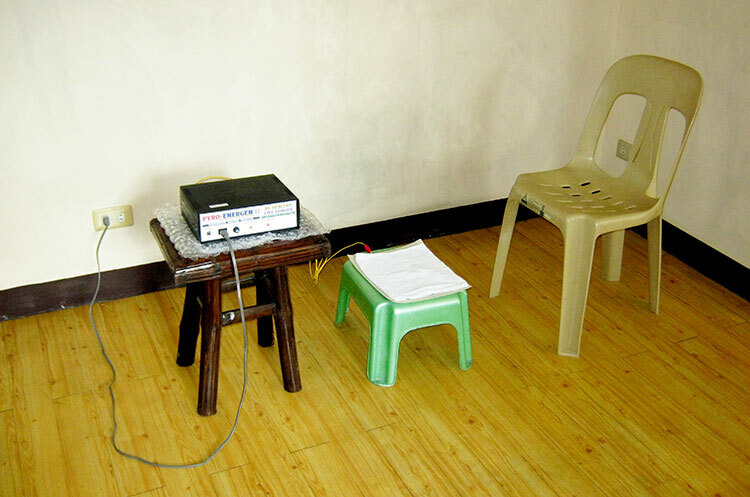 For example, a PYRO-ENERGEN user can mostly hold and use simple small electronic things like a TV remote control without damaging the remote since it is not sensitive to static electricity. Q: My metal screen had already worn out and I need a replacement. What kind of conductor should I use and is there a specific size to follow for best results? A: The size of the electrode (metal sheet/screen/net) to be used is completely irrelevant when it comes to the efficacy of the treatment and the intensity of the static electricity. In fact, the patient’s entire body will be fully enveloped instantly by the PYRO-ENERGEN’s special electric field regardless of the size of the screen and no matter how small the part of the body that is touching the screen. The patient actually just need to make a physical contact to the metal screen with any part of their body that they're comfortable with. As long as the materials (copper, metallic, aluminum) can conduct electricity, any of these types of electrodes can be used. Q: I hear a hissing or static sound coming from the unit while it is running, and I think the unit is leaking power and there is less negative static electricity going to the person. What should I do? A: If the static or hissing sound is coming from the back of the unit, then this is caused by a poorly insulated table, thereby causing some static electricity to leak and jump to the table from the discharge terminal in the back of the unit. You can try using a different table. Or, to minimize this leakage, you can actually place some flat piece of insulated material (e.g. polybag, bubble wrap sheet, or Styrofoam sheet) just under the unit itself. Note: It takes at least 1-2 minutes for the static electricity to fully charge around the user's body. The static electric field will be at its strongest after about 5 minutes of using the machine. 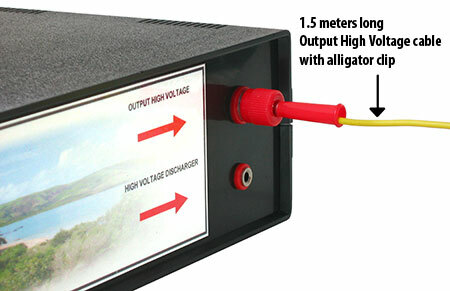 Prepare any size (about 12"x12") of aluminum foil, or metal screen or net, and attach it to the output cable with an alligator clip from the PYRO-ENERGEN. The cable should not be touching to the ground. Make sure the cable is at least 6 inches high from the ground. 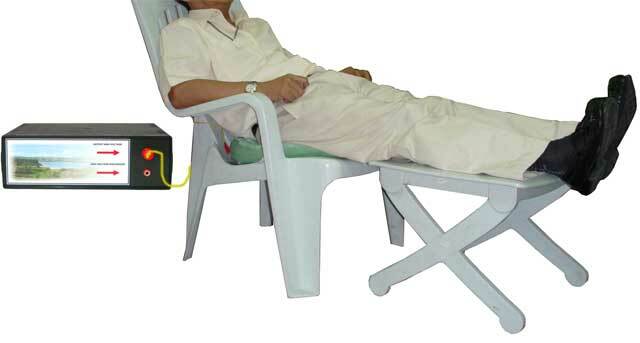 Have the user lie on a nonconductive bed or surface such as a plastic deck recliner or a nonmetallic bed with a foam mattress without metal springs to prevent electrostatic leakage and lesser effectiveness of the therapy. Finally, plug the power cord into the outlet. Be sure not to bring the power cord near the Output High Voltage terminal and cable. The user must not touch any appliance or anything or anyone that is grounded. The two indicator lights should light, then, electrotherapy begins. Treatment frequency of 3–5 times a day, at 30 minutes per session is adequate.